They let natural light in daily. They can hep reduce your utility costs (heating and cooling) year round. But if you’re seeing window fogging and condensation on your windows, it means there’s some air that’s escaping — and costing you money. Following is a guide to help you tackle the formation of water droplets and fogging on your window panes. In the last 2 homes we lived in, I saw window condensation (or window fogging) on some of the windows in our home after I woke up in the morning. We generally turn the heat/air down pretty low at night. It usually happened on the south- and north-facing windows. In search of the best window condensation fix and to get to the bottom of why all this window fogging was happening in our home, I did a little research. 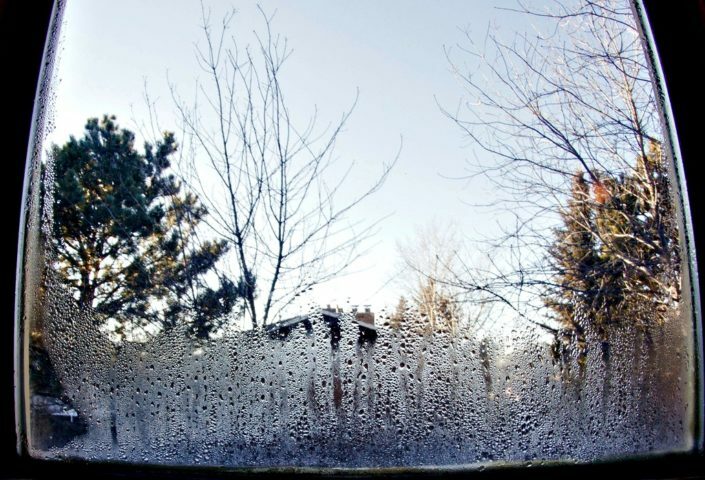 When water vapor builds up and appears as condensation on the outside of an interior window pane, it’s usually caused by high humidity inside your home. Many modern homes are built to be relatively air-tight in order to prevent excess air getting in or out – thus assisting with the cost of heating and cooling the home. However, the tighter seals around the house also mean that the water vapor cannot get outside easily — so instead it builds up as condensation on the window panes. This is particularly common in bathrooms and kitchens. If condensation is building up on other exterior windows of the home, the problem could be much more serious. Generally speaking, window condensation on glass window panes isn’t anything you should worry about. 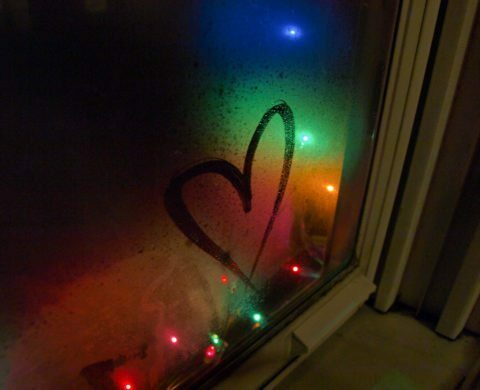 But if you lower the humidity inside your home, it will help to eliminate the window condensation. A dehumidifier is the most common way to do that. A little condensation on the windows that builds up after a shower or boiling a pot of water is not a big deal. However, if condensation on window panes inside your home actually drips onto window sills and starts to cause damage, then you definitely need to address the humidity level inside your home. If your windows are fogging, you should pay close attention to the things inside your home that increase humidity (things that affect air temperature and air moisture) — such as using humidifiers, boiling water, taking showers, mopping, perspiring, and cooking. Even growing plants indoors creates moisture inside your home! Try to lower the humidity level inside your home. You should keep your house under 40% relative humidity in the winter and under 50% in the summer. Here’s how to determine the amount of humidity inside your home. You should be able to reduce the majority of the window condensation simply by increasing the ventilation inside your home. TIP: Bathroom exhaust fans and kitchen range fans shouldn’t be reserved for use only when you’re bathing or cooking. They should also be used to remove moisture from your home during dishwashing, clothes drying, and anything else that brings moisture into your home. If the moisture problem doesn’t resolve itself, then you’ll need to call in a home inspector for a professional opinion and diagnosis. However, with proper ventilation and humidity levels alone, most window condensation issues usually clear up on their own. Condensation on the inside of double-paned windows (insulated windows or thermal windows) is usually caused by the window seals failing around the window panes. Insulated windows are designed with a gas (such as argon) pumped between the panes and silica desiccant pellets inside the aluminum strip to keep the interior space dry. Double-pane windows — particularly the vinyl variety — expand and contract with the weather. This can stress the seal around the panes. If the seal fails, water vapor can get in between the panes and cause condensation to build up where you can’t simply wipe it away. Fixing condensation problems inside window panes is tricky and generally requires a professional. Window defogging consists of drilling a hole in the window and defogging it with a cleaning solution and a vacuum. One common and relatively inexpensive solution is to replace the glazing assembly — which is effective about 75% of the time. Some windows might also require the sashes to be replaced before the condensation will clear up. If the condensation is left to its own devices, water droplets can erode grooves into the glass — permanently marring its appearance. If the silica pellets become saturated, white snowflake shapes may start to appear on the surface of the glass. If you’re seeing this type of silica residue, then your windows definitely need replacing. Whether you’ve installed the windows yourself or had them done by a professional, condensation is a common issue many homeowners face. In my case, we simply had had too much humidity in the house. A dehumidifier worked great for us. It will probably work for you too. Here’s how use a hygrometer to determine your home’s humidity level. A couple pairs of leather shoes that we didn’t wear much and kept inside our garage strangely grew mold all over them within a matter of a few months. Our hardwood floors randomly made loud popping noises. Both were clues that our house had humidity issues. So in addition to the humidifier, I started researching Damp Rid moisture absorbers. Damp Rid is another type of dehumidifier that works well in small rooms (like our garage and master bathroom). Now I keep a Damp Rid hanging moisture bag in our master bathroom and a Damp Rid refillable moisture bowl in our garage (they can be reused using DampRid moisture absorber refills). So the takeaway here is: Don’t jump to the conclusion that you’ll have to replace your windows right away. Start by checking the window seals and adjusting the ventilation and humidity level inside your home first. That will usually take care of most fogging and window condensation issues.